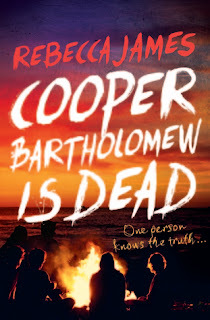 Printed Words: I Expected So Much More From "Cooper Barthomolew Is Dead"
I Expected So Much More From "Cooper Barthomolew Is Dead"
Cooper Bartholomew's body is found at the foot of a cliff. That's the official finding, that's what everyone believes. Cooper's girlfriend, Libby, has her doubts. They'd been happy, in love. Why would he take his own life? As Libby searches for answers, and probes more deeply into what really happened the day Cooper died, she and her friends unravel a web of deception and betrayal. Are those friends – and enemies – what they seem? Who is hiding a dangerous secret? And will the truth set them all free? Cooper Barthomolew Is Dead was one of those books that I was really anticipating, but ended up so different to my expectations. Not a terrible different per se, but lacked elements that I was after in a thriller. The biggest problem I had with CBID was the lack of intensity. There was the mystery, the build up, the plot twist and the reveal. However, there was no edge to any of it. I wasn’t holding my breath waiting to see what would happen next, nor was I surprised by a lot of it. The plot twist was interesting and introduced more depth to character development, but, much like a lot of the novel, there wasn’t much emphasis or focus on it. In fact, with the amount of issues that were included in CBID - LGBQT awareness, family ties, love and loyalty, substance abuse etc. - they were never explored thoroughly. That was another aspect of the plot that I thought could’ve been executed better. I feel like which such prominent issues, especially at the age of young adult readers, it would’ve been ideal to draw out these topics to learn from. I did like though, how there were some real characters. Characters who were flawed and unlikable, but still had redeeming qualities so in the end I was still engaged emotionally with them. Cooper Barthomolew Is Dead was still an enjoyable read. I read it in a day and a half, and for being an easier read, I appreciated it for bringing me out of a really long readings slump. It’s somewhat hard to judge after having expectations that weren’t met, but I have seen some really positive reviews for this so it might be up your alley.